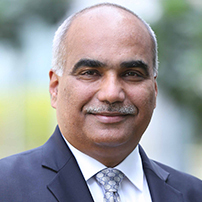 Mr. Sushil Kumar Sayal is Bharti Realty’s Managing Director and CEO since 2014, providing leadership while conceptualizing and implementing a scalable business strategy. Mr Sayal has experience of more than 35 years in the real estate industry. He was the Founding Director and CEO of Alpha G Corp (2004-2014) and Head of Operations -Mahindra/GESCO (1993-2004) prior to that. His realty skills were honed with major developers such as DLF and Ansals in the early years in his career. Before embarking on his illustrious career, Mr. Sayal completed his education with a Degree in Civil Engineering from the Institute of Engineers, Calcutta of which he is also an Associate Member. As a Fellow of Royal Institution of Chartered Surveyors (FRICS) UK, he led teams of highly­ accomplished professionals, toward setting new benchmarks in residential and commercial development . One of Mr Sayal’s major contributions to the sector has been his immense guidance and expertise in defming and establishing – the Real Estate Asset Management (REAM) model in Indian Real Estate Industry. He has won numerous accolades for his valuable contribution to the Real Estate Sector. He has been awarded the ‘Lifetime Achievement Award’ by World Federation of Marketing Professionals in partnership with ET Now in 2018. White Page International, has bestowed him with the ‘Most Admired Business Leader’, followed by ‘Outstanding Leadership and Valuable Contribution to Real Estate Sector’ Award in 2017. It has been Mr. Sayal’s ardent desire to introduce professionalism in the real estate sector. For this Mr Sayal has authored the book ‘Inside Unreal Estate” : A journey through India’s most controversial sector’. The book shares his experiences in the unleveled playing field of the Indian real estate for over three decades.